Many of the worlds prolific hydrocarbon provinces lie in structurally complex passive margin salt basins and many major deepwater fields in these basins are heavily influenced by salt structures. 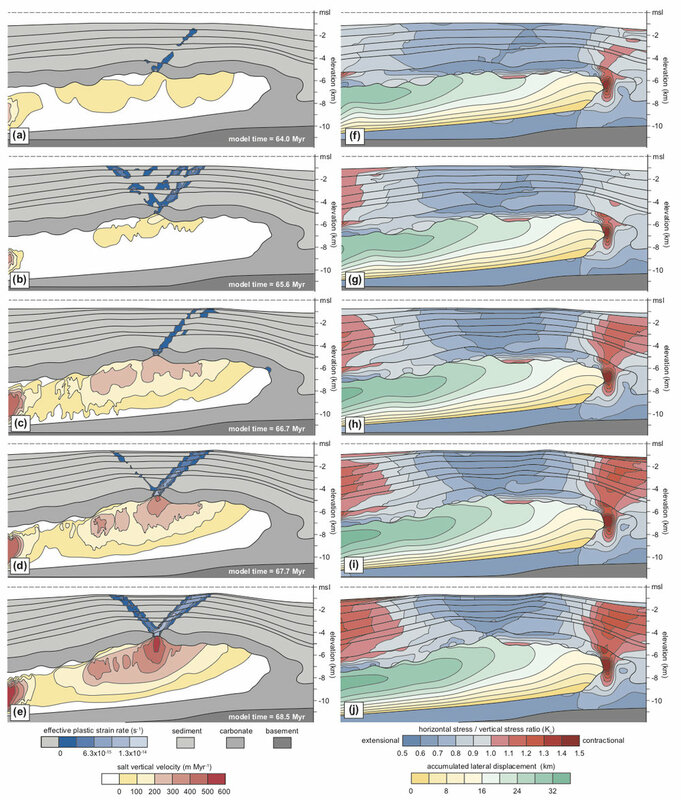 The evolution of these features exerts tremendous influence on the structural geometry of overburden units and the consequent compartmentalization of prospects, the depositional paleobathymetry, and the resultant distribution of lithofacies, which directly drives field developmental planning (i.e. location and number of wells). Additionally, because viscous salt flow rates can result in strain rates much higher than those observed in most geologic systems, salt flow can impact rate-dependent processes such as salt-sediment loading rates, sediment dewatering, and advectionary heat transport, thus allowing salt tectonics to substantially impact pore pressure, basin thermal evolution, and thermal maturation processes. Despite this, many first-order components of salt evolution remain poorly understood, and as result, evolutionary models for many of these fields may yield a high degree of variability. The weak behavior of viscous salt at temperature conditions observed in sedimentary basins yields a deformational style that is unique with respect to other upper crustal systems. Despite this, our understanding of salt mechanisms remains incomplete. Much of our current understanding of salt tectonics is derived from physical analogue modeling, a method which cannot consider critical components such as realistic buoyancy scaling, sediment compaction behavior, and changes in salt viscosity due to thermal-advectionary effects. In the UK Structure and Geodynamics Group, we are developing coupled thermo-mechanical numerical models at a range of length scales to constrain the influence of governing parameters in salt dynamics. Set-up of simplified preliminary model (shown below) designed to test development of margin-scale halostatic pressure. (a) At t=0.0 Myr, an autochthonous salt layer 5 km thick (pink) is overlain by an elastic material (gray) 2 km thick, which is in turn overlain by a progradational sediment wedge (teal) that thins in the basinward direction. (b-d) From t=1.3 Myr to t=3.0 Myr, differential gravitational loading of the salt layer by the sediment wedge drives salt from left to right, resulting in the development of an uplifted arch at the basinward end of the model. An elastic material without a defined failure envelope was chosen for the roof carapace to prevent failure and allow the maximum possible halostatic pressure and differential stress to be generated at the downdip end of the margin. Results of simplified preliminary model shown above. An elastic material was chosen for the cover sequence to prevent failure of the roof and determine the maximum pressure load that could be placed on the roof in the downdip end of the halostatic system. (c-e) Differential stress (max. stress minus min stress in the plane strain model) after 3 Myr of sediment loading. (d) Differential stress shows two compressional 'hotspots' on the underside of the downdip end of the arch (salt-roof carapace contact) and in the toe of the system where thrust faulting is often observed in natural systems. An extensional hotspot (>175 MPa diff. stress) is also recognized on the surface of the downdip arch. All three zones would be primary regions for failure localization in most natural systems. (e) Contours of differential stress overlain with vector orientations of minimum (red) and maximum (blue) compressive stress to show the complexity of the stress (and presumably strain) field that develops in these systems. It is important to note that all of these results are modeled as drained conditions, so pore pressure is not currently considered.